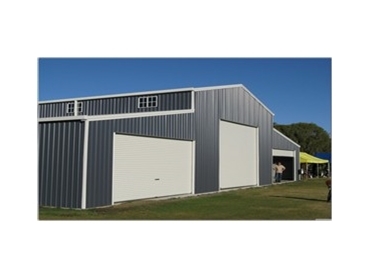 Dinky Di Sheds manufactures and supplies a variety of premium steel buildings for various applications, including three types of barns. American barns from Dinky Di Sheds are well suited for use as farm sheds or horse stables. They can be upgraded with a mezzanine floor for storage upstairs, or can be increased in height to provide room for a second storey living quarters. All widths, heights and pelmet drops on these barns are adjustable to suit the needs of clients. Featuring a downstairs garage and large living quarters upstairs, Quaker barns present many options for multipurpose use. Economically priced, they include roller doors on one side that can be deleted to create an aesthetically pleasing two storey residence. Aussie Barns are similar in design to American barns, but instead of a traditional step down onto the lean to, the roofline continues on these sheds, with a change in angle, to provide a rustic yet contemporary looking ‘Aussie shed’.